Oliver is an inspiring, positive, happy soul that is continuously showing us how to love others. As he battles leukemia, it is heart-breaking, but Oliver remains so bright, so cheerful. He's just a light to everyone around him. So many people have asked how they can help? I've asked that myself repeatedly. None of us can make the leukemia go away, which is hard to accept. But what we can do is to offer support to his family as they care for him. This is Oliver's second battle in the war against Leukemia. He was diagnosed with AML on Sept 4, 2016. He spent all but a few days in the hospital from Sept 4th to Jan 6th . When I asked him what he missed most during those months, he immediately said, "my sister's birthday." He had wanted to make it special for her. During those months, he planned and looked forward to the day he would be able to take his little sisters to Build-A-Bear and treat them to a stuffed animal of their choosing. Being kind and helping others truly defines so much of who Oliver is. Meanwhile, Oliver filled hallways of the hospital wing with art, crafts and conversations. 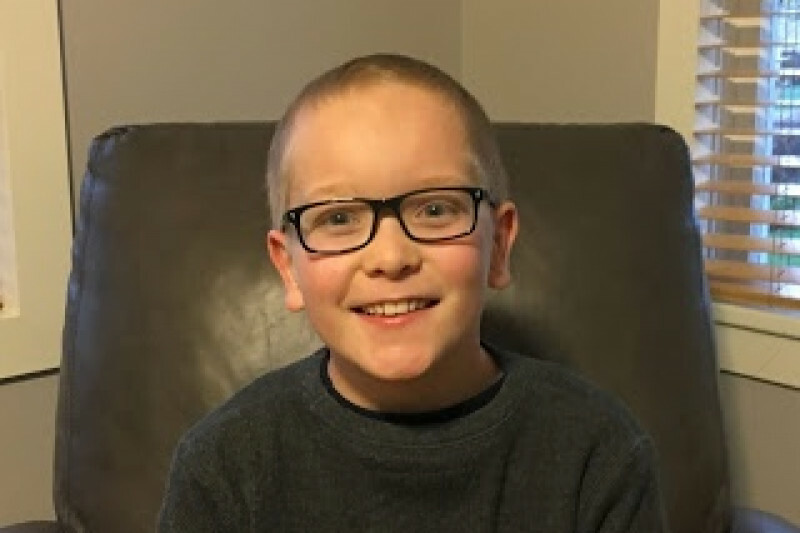 Often Oliver was confined to his room due to his severely compromised immune system. Once he was out, he found ways to play games through the windows with other cancer kids quarantined to their rooms. He's been known to chat and chuckle with nurses at 2am, in his pleasant "Oliver way." He just loves people and he is basically impossible not to love back. Oliver relapsed on April 18th. He's back in the hospital, fighting again with the smile and light that we all love. Due to the rigorous nature of his treatment, he needs to be in the hospital for weeks, possibly months, at a time. Jana has stepped away from her job to be at the hospital full time and give Oliver all of the love and care in her heart. The entirety of the process from chemo to bone marrow transplant and recovery is expected to take at least one year. Bill and Jana did not want to start a fundraising site as Oliver bravely fought his first battle against Leukemia. After months and months of hospital stays, care and bills that will now be dramatically increased as Oliver fights his second battle, they have relented and allowed us to try to help relieve some of their burden. At this time, any donation to help them handle the overwhelming costs of medical care and medical-related expenses would be greatly appreciated. Oliver's parents, Bill and Jana Tibbitts, have greatly appreciated the outpouring of love from so many. Please keep praying for Oliver. One of the best ways we can also support Oliver is to register as a bone marrow donor. You might be able to save a life. Thank you all for your support of Oliver and his parents and sisters. Utah friends and family! We can't make it to the big party planned for Oliver this coming weekend, but invite you to go join the party for us. Oliver is worth celebrating! Oliver is back in the hospital, fighting and enduring. We love this boy! Here's the actual newest update on Oliver's battle. It's some rough news. We're praying our hardest for Oliver! Thank you for sharing this sad news. My deepest sympathies to Bill and his family.